In the remote northeast province of Tras-os-Montes lies traditional farming country. Here, rural communities provide a getaway destination for those who enjoy exploring off the beaten track. 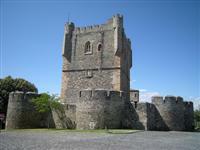 The small provincial capital, Bragança, lies close to the Spanish border and is slowly being discovered by tourists. This is mostly because of its fine local museum and the small medieval village and castle on a hillock overlooking the town. The interesting feature of the castle is the pillar beside it that rises from the back of a carved granite pig ('Porca'), which is believed to be a fertility idol from prehistoric times. Between the medieval citadel and the cathedral is the garden of the Museu do Abade de Baçal, containing not only tombstones but also numerous representations of the 'porca' idol. The museum itself houses a collection of sacred art and watercolours painted by Alberto Souza. In the medieval citadel is the Domus Municipalis, a pentagonal 12th century civic building which is unique in Europe.